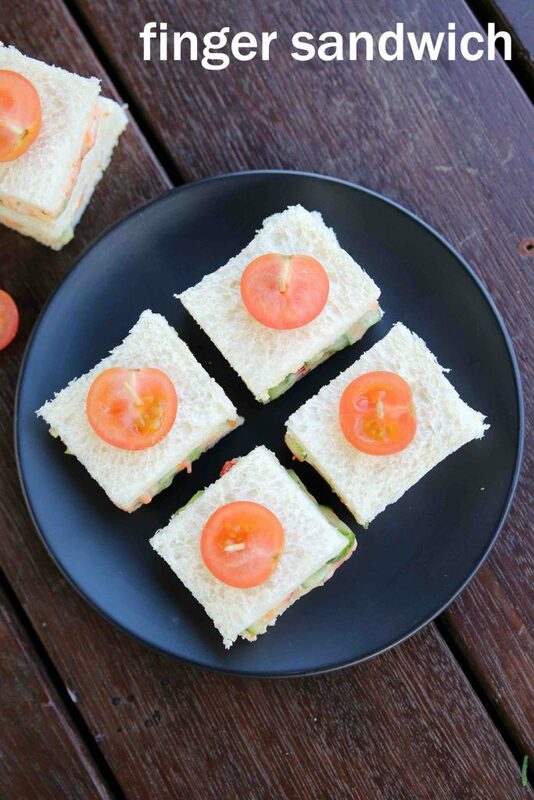 finger sandwiches recipe | tea sandwiches | party mini sandwiches with detailed photo and video recipe. 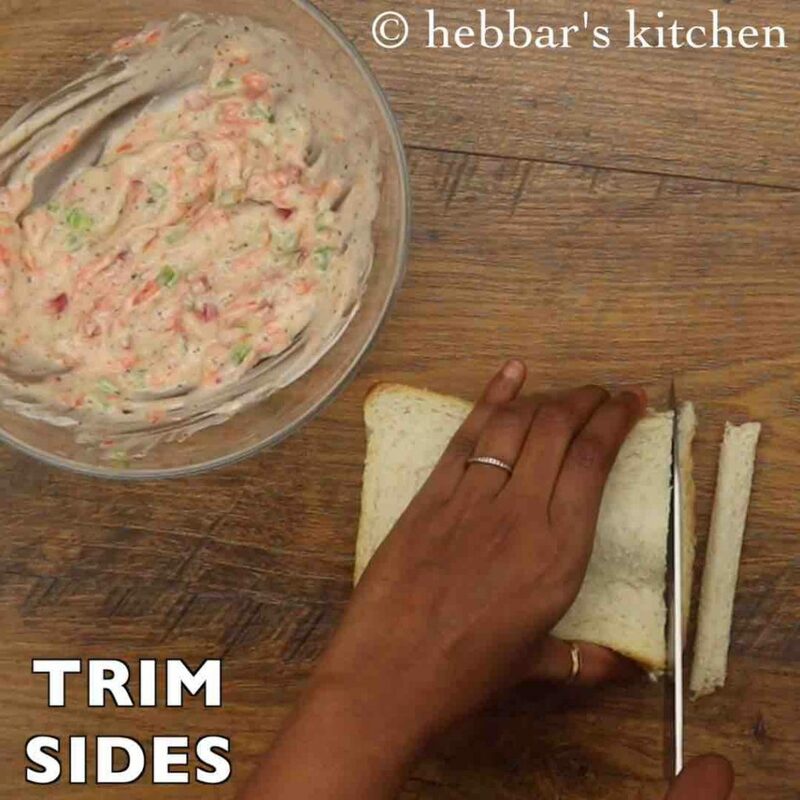 a simple and attractive, mini size sandwich recipe, targeted mainly for occasions and parties. moreover, because of the mini size, it can also be served with evening tea and also for surprise guests.it can be prepared with myriad stuffing which include both veggies and meat, but this recipe is made with veggies. finger sandwiches recipe | tea sandwiches | party mini sandwiches with step by step photo and video recipe. sandwich recipes are very common and easy breakfast option for many households. it can be made with a variety of bread with numerous stuffing ranging from meat-based to vegetable based or combination of both. 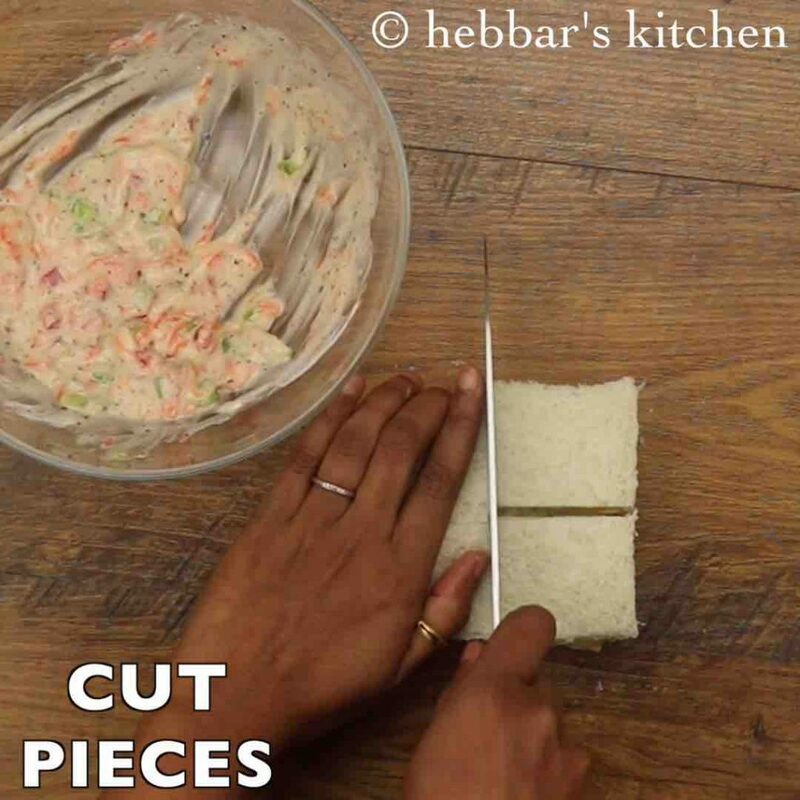 finger sandwiches recipe is one such mini sandwiches made with the purpose of finger snacks. 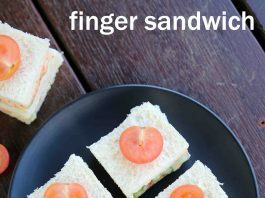 this recipe of finger sandwiches recipe is very unique compared to other traditional sandwich recipes. 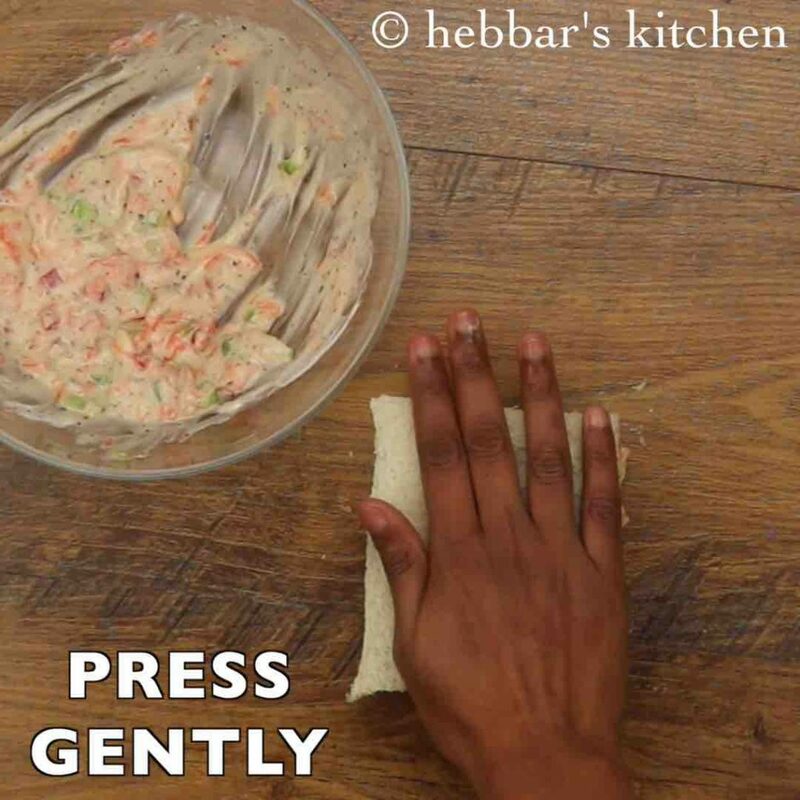 having said that it is very similar to my previous post of pinwheel sandwich recipe. the similarity is only with the size and appearance, but a lot easier to prepare these tea sandwiches recipe. there isn’t hassle to pin and roll the bread and more importantly to fold and finally pin it. further, i personally find finger sandwiches more presentable and appealing with its mini size shape. hence it is an ideal recipe for any party or even for your next potluck party. 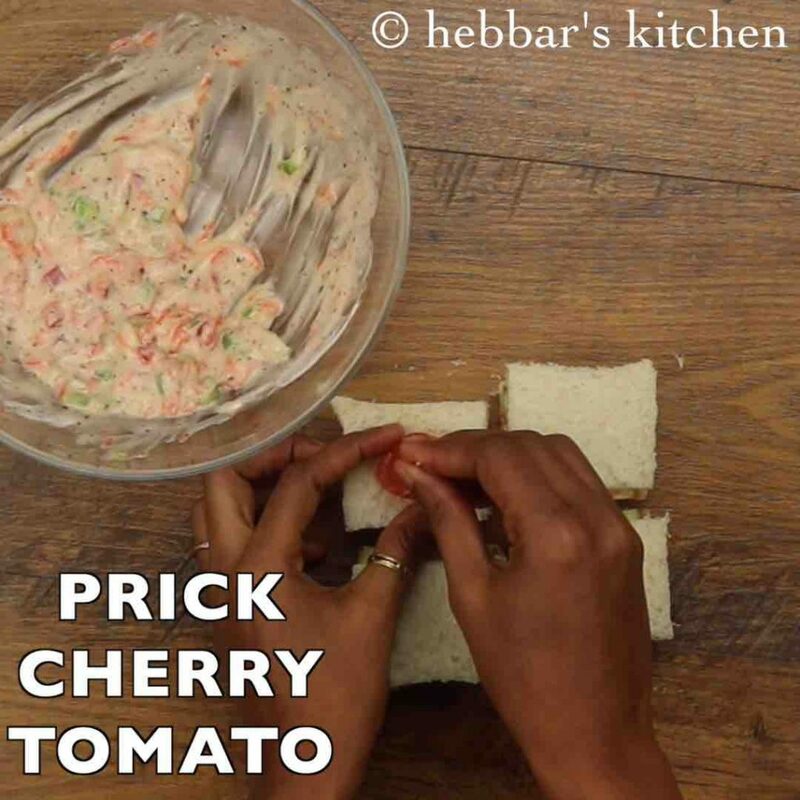 furthermore some easy tips and suggestions for a perfect finger sandwiches recipe. firstly, this recipe can be made with any choice of bread, including multigrain and wheat bread. but the white sandwich bread is ideal and looks more presentable due to the colour contrast. secondly, the stuffing can be easily mixed and matched as per your preference. in this recipe, i have used eggless mayo as its base, but even cream cheese or hung curd can also be used. lastly, in this recipe, i have used only 2 bread slice, but you can also use 3 bread slices with stuffing between 2 slices of bread. finger sandwich has to be small and mini in size as per its name and hence i have used only 2 slices. 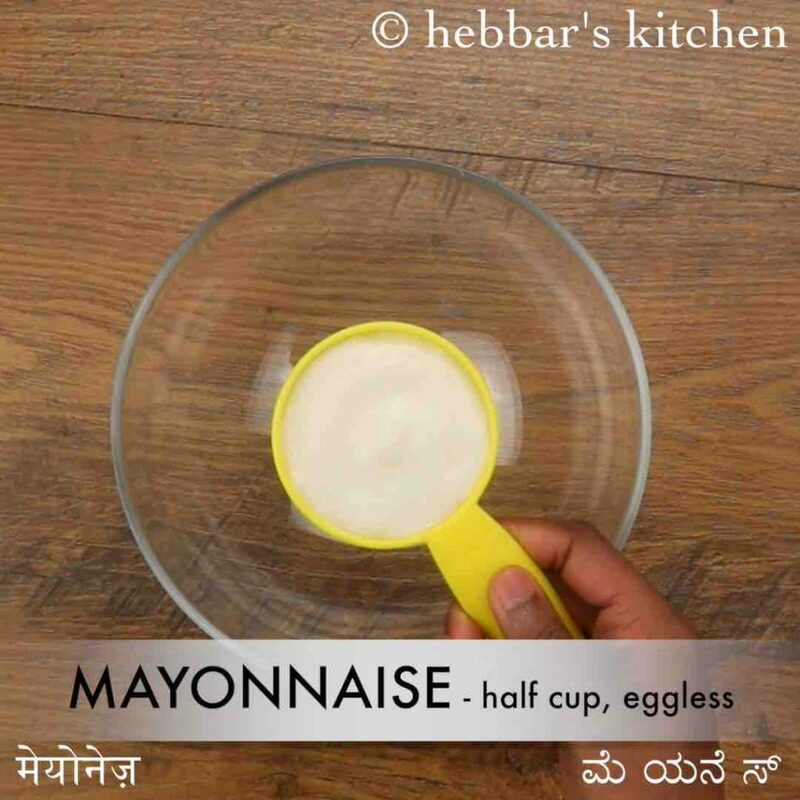 firstly, in a large bowl take ½ cup eggless mayonnaise. you can alternatively use hung curd if you are diet conscious. 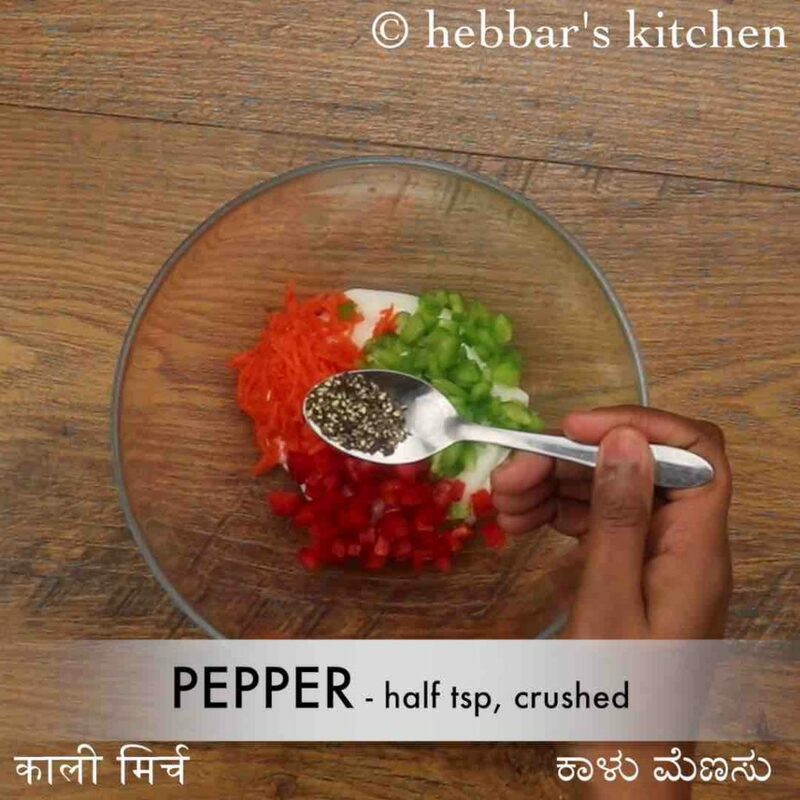 also add ½ carrot, 2 tbsp green capsicum, 2 tbsp red capsicum, ½ tsp pepper, ½ tsp mixed herbs and a pinch of salt. 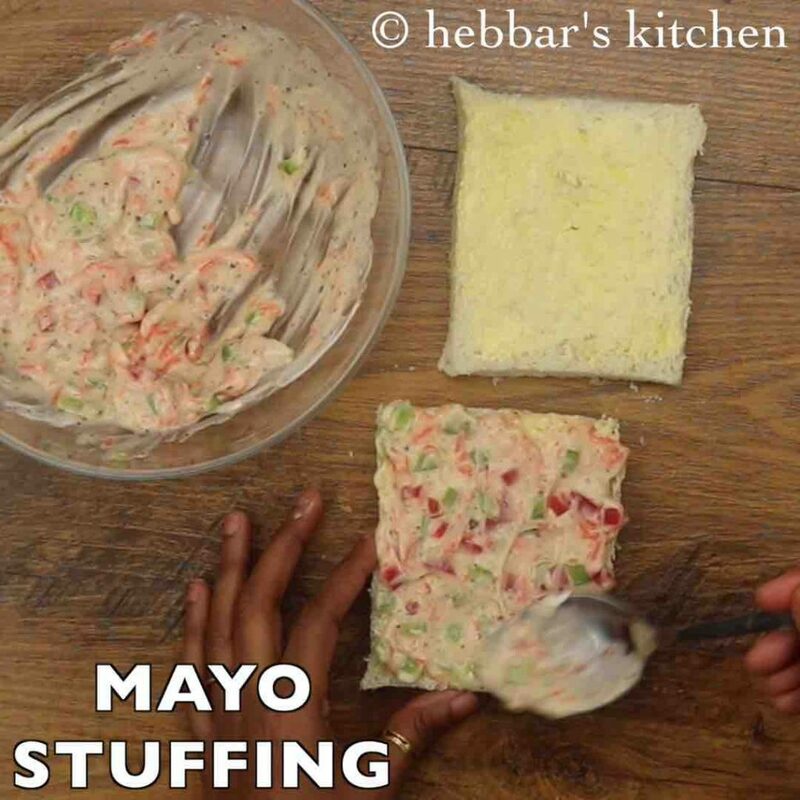 mix well and mayonnaise stuffing is ready. further, take 2 slices bread and trim sides. 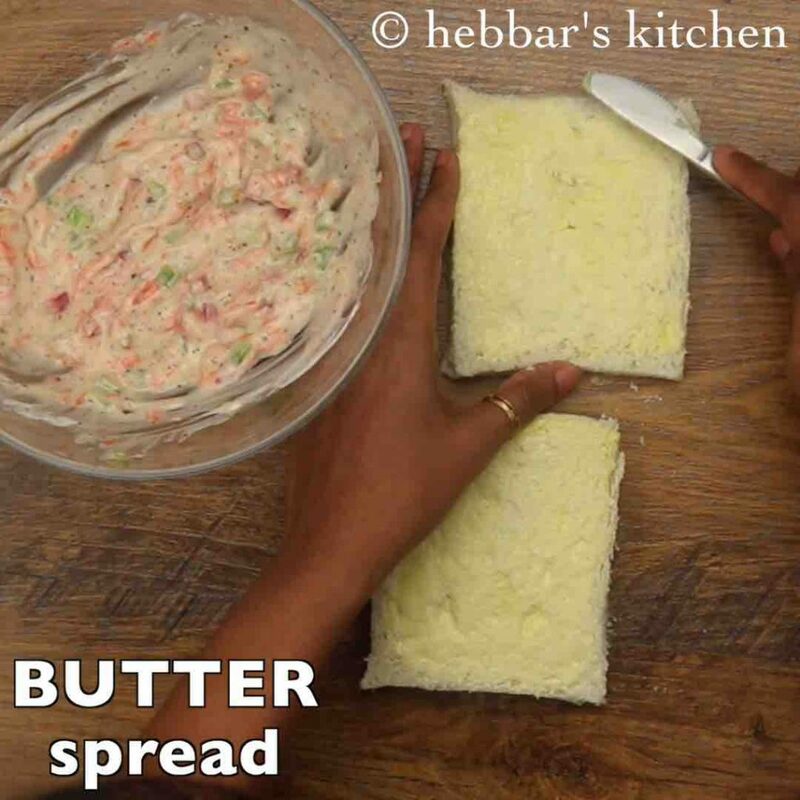 spread ½ tsp butter over each slice of bread. now spread 2 tbsp of prepared mayonnaise stuffing. 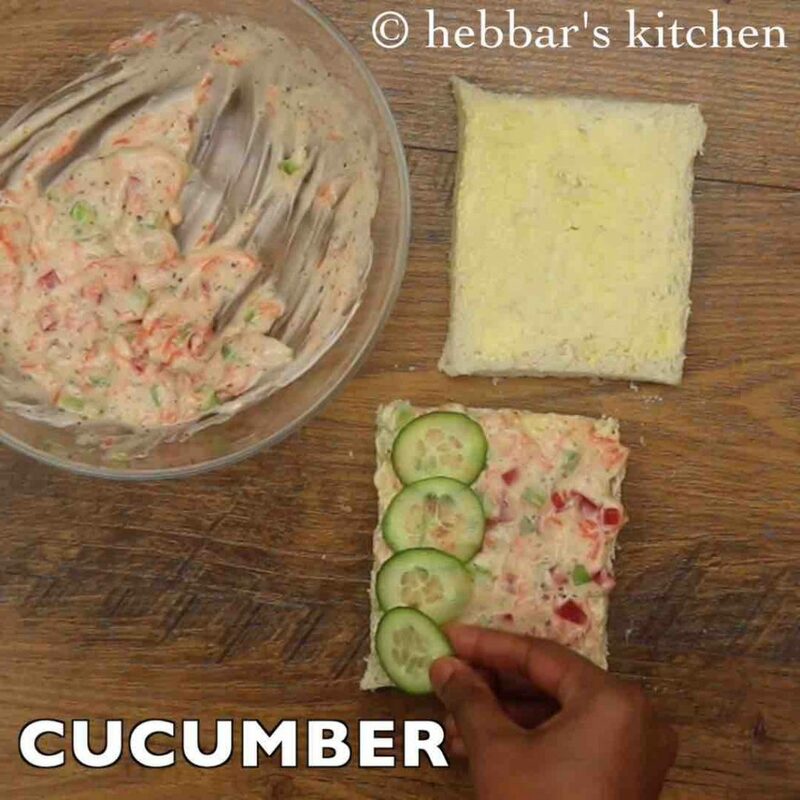 place slices of cucumber over stuffing. cover with another bread slice and cut pieces. 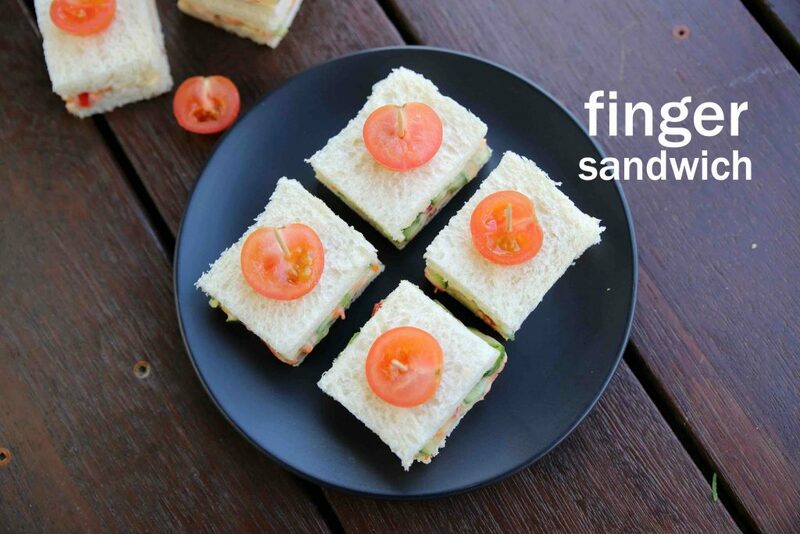 finally, serve finger sandwiches as a tea time snack. cover with another bread slice (butter side facing down) and press gently. cut into 4 pieces or size of your choice. with the help of a toothpick, prick cherry tomatoes. also to make the sandwich more healthy and nutritious, add boiled corn and spinach leaves. additionally, you can replace cherry tomatoes with olives or any fruit to make it look attractive. finally, finger sandwiches or tea sandwiches taste great when kept light and simple.